The organ was made in 1982. It was based on late 17th century English chamber organs. 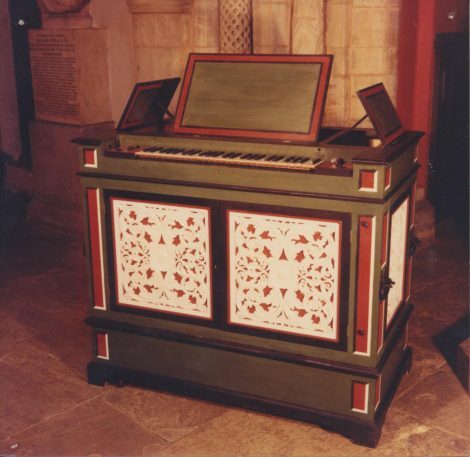 The Stop’d Diapason was copied from the same stop in the organ now at Canons Ashby House (National Trust), but then belonging to Colin Tilney. The other pipes are based on it and the metal flue pipes in the organ at Compton Wynyates. The regal is copied from a late 17th century South German example in the Victoria & Albert Museum (if they haven’t disposed of it elsewhere). The key compass is C- d³ at A415Hz, with four available pitches. The usual tuning is Valotti’s temperament. There is a single-fold reservoir and a single-fold feeder operated by a foot pedal, as well as a separate blower. The organ has been used in recordings, e.g. of William Lawes. The case is made of pine, painted red, black and white on a green background. The dimensions are 1200mm wide, 1030mm tall and 650mm deep. The case is divisible for carriage. The organ has belonged to the harpsichord builder Alan Gotto and now belongs to the harpsichord player David Wright.